In this latest beta patch we found ten new pets in the Pet Journal, plus one that was not listed. You may recognize these first four pets (pictured right), as we mentioned them previously in our preview of new pet models and colors. The Axebeak Hatchlings are likely wild and will be found in Draenor. 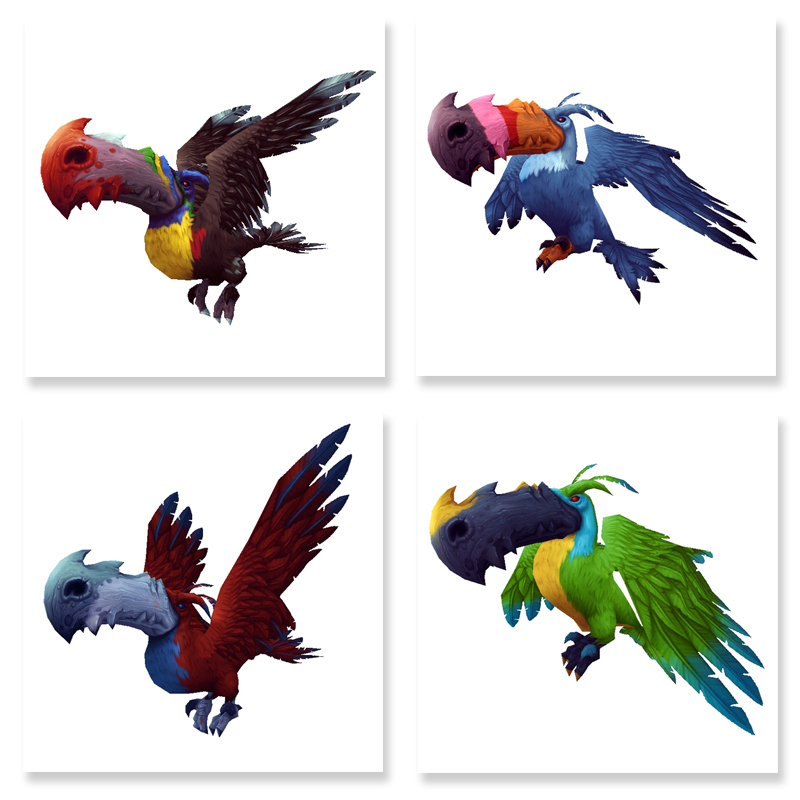 We're happy to see that these beautiful birds will be joining our collections in WoD! Next, there are two holiday pets, the Lovebird Hatchling from Love is in the Air and the Bush Chicken from Pilgrim's Bounty. The Bush Chicken is currently listed in the Pet Journal as a vendor pet from Love is in the Air, however developer Jeremy Feasel notes that this is a bug. Instead, players will "rescue it from a delicious doom during Pilgrim's Bounty". A new Grand Master Trainer will be appearing at the Darkmoon Faire in WoD, Christoph VonFeasel. Completing his daily quest rewards Greater Darkmoon Pet Supplies, which has a chance of dropping a pet, Syd the Squid (pictured above). The final three newly discovered pets come from varying sources according to the Pet Journal. Last but not least, there is one additional pet that was not included in the Pet Journal, Mystical Spring Bouquet. Much like the balloons and most kites, the Spring Bouquet will not have stats or be able to enter a battle. It looks like it will be a lovely, colorful companion though. Leveling hundreds of pets might be daunting for many players, however there might be some help on the way. The latest beta patch added ten family-specific battle-training stones. Unlike the previously datamined leveling battle-stones, these grant a pet only one level and are not marked as "testing" items. It's still unknown where these new stones will come from, or how common they'll be. Battling and leveling aside, some pets just want to have fun! 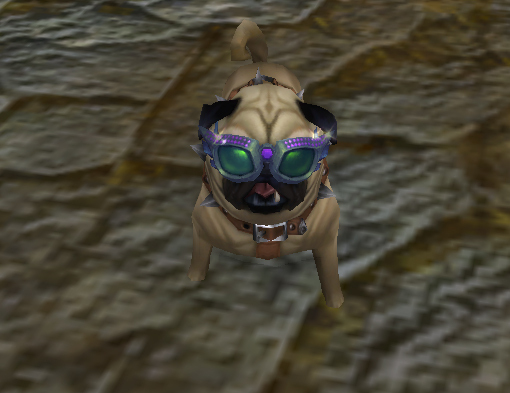 Three new vanity items for the Perky Pug will be available in WoD, "Lil' Starlet" Costume (pictured right), "Mad Alchemist" Costume, and Perky Blaster. Playing dress up with your Pug is all fine and dandy, but take care when handing your pup fireworks! Of course you have wasted your time. Your are playing computer games! That aside, please stop with the "in the old days we walked to school, 1 hour, up hill both ways" sillyness. Making it easier, might make it so that more people get into pets, and that is a win in my book. These days people expect to start playing, push a button + have the highest level, best gear, all the xmogs they want, all the mounts & battle pets, immediately made rare and level 25, and if a huntard - the rare spawn pets. And if they pvp and can't push a button to win, get max arena rating and all the best pvp gear (immediately xmog'd), then it's not fair because they're the ONLY people paying for the game. No one else has to suffer the onerous and arduous task, why should they? I'm just wondering how trainer levelling will be in WoD. If it's similar to Pandaria then levelling fresh pets will be easy enough and these stones will really only aid players who are just getting into battle pets (which is really the worst part). I'm hoping though to be able to get my entire roster to 25 before WoD hits so I'll only have to worry about levelling new pets as I acquire them. I've got 575 level 25 pets and even more that I've level up to 25 that I've sold or traded and I have to disagree with you. The stones grant a single level for a single pet. They would need to be common as dirt to have any significant impact on leveling up your entire pet collection. They are currently showing as BoP so you won't even be able to buy up a stack of them to quickly get your first pet to level 25. In the end they'll just be an occational extra level while working on a long grind.